Out Of Darkness | New Growth Hair Magazine | We capture the culture of urban barbershops and beauty salons. Amadeuz Christ is a film director, editor, and founder of Building Seven Media, a San Francisco Bay Area based media production company. Since 2011, Amadeuz Christ has directed and edited over 30 music videos which have appeared on MTV, RevoltTV, HipHopDX, Thisis50.com, and XXLMag. He has worked with popular Hip Hop artists including Kendrick Lamar, Big K.R.I.T., Nipsey Hussle, Locksmith, 9th Wonder, C Plus, and Sahtyre. Amadeuz Christ grew up on rap music and was heavily influenced by 2Pac. Before entering the music industry, Christ said he had a romanticized view of the music industry and thought he could create social change through Hip-Hop. After several years in the industry, Christ became uninspired and concluded that Corporate America was pimping Hip-Hop culture. Christ felt that rap music was no longer a tool to uplift children in economically deprived environments. Heartbroken from this revelation, Christ transformed his pain into his first documentary film project. Below is my in-depth interview with Adameuz Christ about his new film entitled Out Of Darkness. Phillips: What inspired you to create Out of Darkness? Christ: Ten years ago, I started my career as a rapper by releasing my first album. As an independent artist with a distribution deal and a limited budget, I learned a variety of skill sets to save money. So in addition to rapping, I learned how to be an audio engineer, mix albums, and produce records. The only skill that I lacked was the ability to shoot and edit music videos. The music industry can be very stressful because of the industry politics and street drama. Before I decided to take a break from music, people close to me in the industry were killed and involved in shoot-outs. In 2007, my first son was born and his birth caused me to reevaluate what was important in my life. I decided to go back to school to study film and to take a position at Google. While in college, I learned video editing and how to direct videos. As a college student, I received an opportunity with a local radio station which allowed me to interview rap artists and to film their concerts. We captured video of Kendrick Lamar, Ab-Soul, Nipsey Hussle, Big K.R.I.T., Casey Veggies, Fashawn, and other up and coming artists. After their shows in Oakland, our videos were all over the blogs and internet sites which opened doors for me to start directing music videos. After we started working the major labels, we started to see the same industry politics again. So I took a break from the music industry and I tried to see if I could make a lateral move within Google. I worked for Google for seven years with positive employee reviews. My managers and co-workers told Google’s Film Team that I would be an excellent fit but I never got a response. For three years, I applied for every film related job in the Bay Area without any success. In 2012, the ancestors spoke to me and told me to use my talents to help our people which motivated me to start doing some serious research. Before I started my research, I didn’t know anything about our history. I heard people say that we used to be Kings and Queens but that’s about it. After watching a YouTube video entitled “Black People You Are In Trouble” that featured Dr. Claud Anderson, I was motivated to start on a journey that led me to create Out of Darkness. After conducting my research for the film, I concluded that the institutional racism and discrimination cause me to create this film because corporate America denied me access to an employment or contractor opportunity in the film industry. What role did your experience as a rapper, music producer, and music video director play in you making Out of Darkness? Christ: Yap, my photographer’s business partner was working on a film called Sydewayz, a documentary film about the Oakland, California’s Sideshow Culture. He asked me to write an intro for Sydewayz. After Yap saw my work he was extremely excited and he asked me to record my voice for the intro for the film. During the process of working with Yap, I saw him edit video and his software looked very similar to my audio editing software. My experience working with Yap and being a part of Sydewayz showed me how music and film were connected. What did you learn from making Out of Darkness? Christ: After completing this film, I have more self-confidence, I love myself, I love my people, I feel a much deeper connection to Africa, and my eyes are wide open. I learned the importance of Ancient Kemet (Egypt) in our history and what we as African people introduced to the world. Ancient Kemet (Egypt) was a child of Africa and I wasn’t taught any of this when I was a child. Also, I learned that we civilized Europe from 711 AD to 1492 AD, the year that Christopher Columbus supposedly discovered America. Europeans learned to sail the seas because of the knowledge brought to them by The Moors. In grade school, I was taught that Africa was in darkness and Europe was experiencing an intellectual enlightenment during the Renaissance but they failed to tell me that my ancestors brought the knowledge to Europe that sparked the Renaissance. Please tell our readers what they can expect from the film? 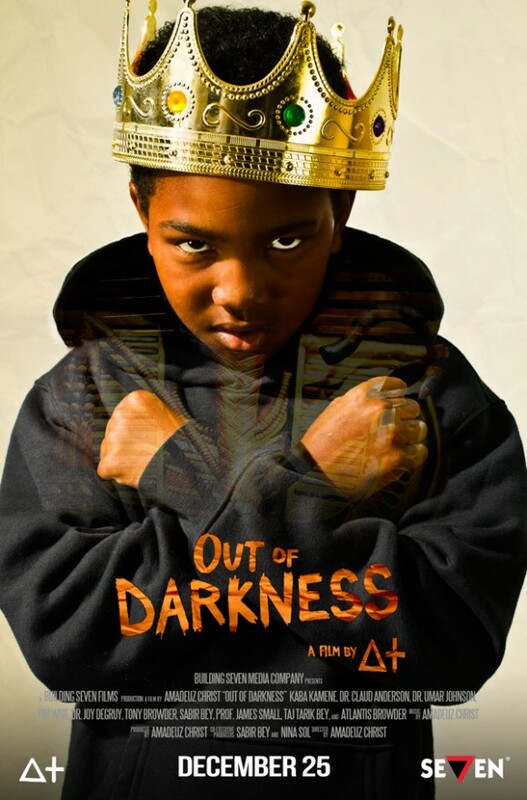 Christ: Out of Darkness is a three part documentary film that is narrated by Prof. Kaba Kamene and co-stars Dr. Umar Johnson, Dr. Claud Anderson, Tim Wise, Prof. James Small, Dr. Joy DeGruy, Anthony Browder, Sabir Bey, Atlantis Browder, and Taj Tarik Bey. The first act addresses the untold story of our African history. The second act deals with the social-psychological issues that affect our community such as racism/white supremacy, the illusion of inclusion, the conquest of the mind through religion, the colonization of a white God, and post traumatic slave syndrome. The third act shows the African origins of Hip-Hop culture, the Illuminati, and nation building. The film is a teaching tool and hopefully it will inspire people to find solutions to the issues affecting our community.